Win a BMW i8 at Sky Casino + Weekly bonuses and free spins. To coincide with the launching of the revamped dedicated live casino studio at Sky Casino they’re offering a great promotion to win a BMW i8. There’s also an additional weekly prize draw for ticket holders for bonuses and free spins. 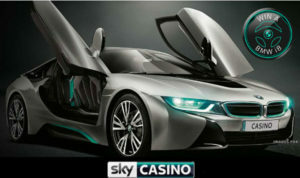 A BMW i8 Sports Car – automatic, 20” BMW I Turbine-spoke alloy wheels, Neso interior world interior. Either in Sophisto Grey / Frozen Grey accent, metallic or Sophisto Grey / BMW I Blue accent, metallic, OR a £60,000 cash alternative. The promotion runs from the 3rd April to 7th May 2017. For every £10 you play through, you’ll receive 1 ticket for the prize draw which will be held on the 8th May 2017. There is no limit on the number of tickets you can win. There is also a weekly prize draw being held for ticket holders, where you’ll have the chance to win Cash Bonuses or Free Spins. 3 tickets a week are needed to qualify to be in the draw. The weekly prize draws will be held on the 9th, 16th, 23rd and 30th April. The bonuses have 1 x wagering attached to them. The free spins can be used on the Age of The Gods, or DC themed slot game. All Free Spins come with 1 x wagering. 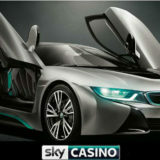 To be eligible for these draws you have to OPT IN on the Sky Casino website.